Since it was rebranded and updated with new benefits and earning rates in 2018, the American Express® Gold Card has been one of our top picks for dining purchases. It offers the highest return on spending at US restaurants, plus up to $120 in dining credits each calendar year. It also has a sleek metal design, available in gold (and previously available in a limited-edition rose gold). If you’re considering the Amex Gold, you’ll want to know that its features make it worth the $250 annual fee (see rates & fees). So let’s dig in, shall we? If you like to eat out (or order in through delivery services like Seamless) and you can make good use of American Express Membership Rewards points, this card is a no-brainer. It could also be a good pick if you want the opportunity to earn some serious rewards with your credit card but are wary of paying an annual fee in the $450-$550 range. The Amex Gold card is currently offering a welcome bonus of 35,000 Membership Rewards points after you spend $2,000 in the first three months. Based on TPG’s latest valuations, that bonus is worth $700. To be honest, it’s not the most impressive, considering that we see 50,000- to 100,000-point bonuses on other cards regularly. But you may be able to get a 50,000-point welcome bonus through the Amex website, a referral link or through the CardMatch tool — it’s definitely worth seeing if you can nab this higher offer, which would be worth $1,000 based on TPG’s valuations. The 4x on US restaurants is an especially strong earning rate — equal to an 8% return based on our valuations. The only bummer is that the bonus is limited to dining in the US, as opposed to the broader worldwide dining bonus category on cards like the Chase Sapphire Reserve. 4x points at US supermarkets is also very strong, though note that it’s capped at the first $25,000 you spend per calendar year (then 1x). But even with the cap, the Amex Gold becomes one of the very best cards for grocery spend, which is obviously a common expense that almost everyone incurs. 3x points on flights purchased directly from the airline or at amextravel.com isn’t bad, either — equal to a 6% return based on TPG’s valuations. The Membership Rewards points you’ll earn with the Amex Gold can be transferred to 21 travel partners, consisting of 18 airlines and three hotels. For instance, you can transfer points to Etihad Guest to book business-class flights to Europe on American Airlines for 50,000 miles each way, among other great redemption options available through this unsung program. ANA also provides plenty of value, especially if you can leverage one of the transfer bonuses Amex frequently runs to score a first-class flight for well under 100,000 points. On the hotels side, you can transfer points to Choice Hotels, Hilton and Marriott. You’ll generally get the most value from your Amex points by transferring them to a travel partner, though that isn’t your only redemption option. You can also use points to cover charges on your billing statement, to shop on Amazon, to cover Uber rides, to buy gift cards and more. And you can use points to book travel directly through Amex. Read our guide on “Redeeming American Express Membership Rewards for Maximum Value” for more info on maximizing your Amex points. $120 Annual Dining Credit — Earn up to $10 in statement credits monthly when you pay with the Gold Card at participating dining partners. The list is as follows: Grubhub, Seamless, The Cheesecake Factory, Ruth’s Chris Steak House and participating Shake Shack locations. This statement credit functions similarly to the Saks credit on the Amex Platinum in that it isn’t allotted all at once. Also note that you’ll need to enroll through the Amex website to get this benefit. $100 Annual Airline Fee Credit — Each calendar year, you’ll receive up to $100 in statement credits toward incidental airline fees such as baggage fees and inflight purchases. You have to pick a qualifying airline for the credit, and you can only change this once a year, so be sure to choose a carrier you’ll be flying with at least once. The Hotel Collection — When you book a stay through the Amex Hotel Collection, you’ll earn 2x points on your purchase and enjoy a $100 credit toward dining, spa and resort activities at the property. Note that the credit only applies to stays of two consecutive nights or longer. Baggage Insurance — If your luggage is lost, stolen or damaged when you’re traveling with a common carrier and you purchased your ticket with the Amex Gold, you’ll be eligible for up to $1,250 in coverage for carry-on baggage and up to $500 for checked baggage. If you can maximize the annual dining and airline credits on this card for a total of $220 per year, you’ve almost offset the entire $250 annual fee, which means you only need to get an additional $30 worth of value each year from the card to come out ahead. Which Cards Compete With the Amex Gold? With an annual fee that’s higher than sub-$100 cards like the Chase Sapphire Preferred Card but considerably lower than the $450-$550 premium cards, the Amex Gold is somewhat of a “tweener.” So while there’s no perfect direct comparison on the annual fee front, there are several cards that offer similar bonus categories and perks. One of the most obvious comparisons is the Sapphire Preferred itself, with a $95 annual fee and 2x earnings on all dining (and travel) purchases. We value Chase points at 2 cents apiece (our same valuation for Amex points), so you’re looking at an effective return of 4% with the CSP vs. 8% with the Amex Gold on dining purchases in the US. The CSP also doesn’t offer any annual statement credits like the Amex Gold does. On the premium end of things, the Chase Sapphire Reserve deserves a mention, as it was previously the reigning champ for the highest return on dining spending, with a 3x earning rate. But the Amex Gold now tops that card’s 6% return, and handily — the downside being it’s just for dining in the US. The Sapphire Reserve has a $450 annual fee, and as you’d expect, it offers considerably more perks than the Amex Gold, like a $300 annual travel credit and a Global Entry/TSA PreCheck application fee credit. If you’re enticed by the Gold Card’s 4x bonus at US supermarkets, you could also consider the Amex EveryDay Preferred Card from American Express. It earns 3x points at US supermarkets on the first $6,000 spent each year, and if you make at least 30 purchases in a billing cycle you’ll get a 50% bonus. That means you’d get a return of 9% with the bonus. This card also has a much lower annual fee ($95), but note the much lower cap on bonus earnings for US supermarket purchases each year. The Amex Gold isn’t just a pretty card; 4x points on US restaurants and US supermarkets make it a very strong pick for pretty much all food purchases too. And who doesn’t love/need food? The $220 in annual statement credits — between the dining credit and the airline fee credit — add value, and also make the $250 annual fee easier to swallow. 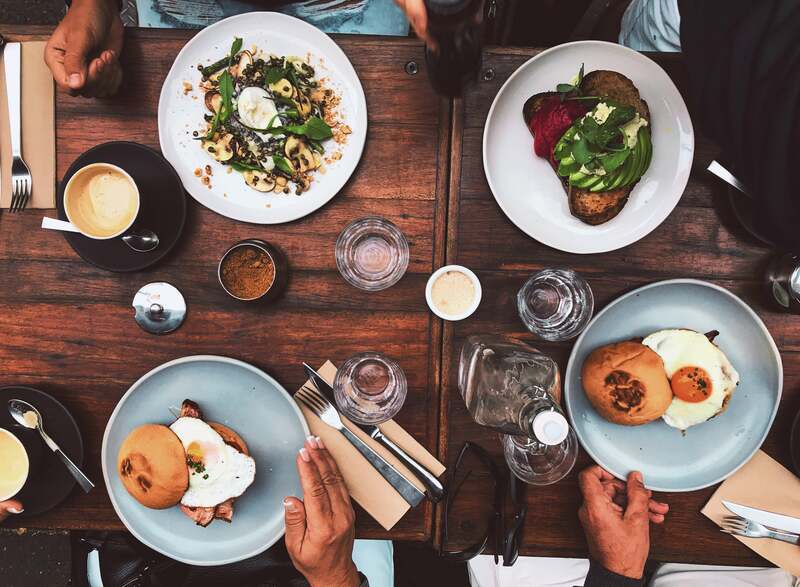 The welcome bonus won’t turn heads, but the American Express Gold Card could still rack you up plenty of points through everyday use when you’re eating, either at home or out and about.